What is written in the stars for you in 2019? Let us take you by the hand in 2019 and find out what the stars have in store for you. Take the first steps into the new year with your 2019 year horoscope. Make your New Year’s resolutions come true and make 2019 an unforgettable year! We will guide you and take you on a path through the stars. Our resolution this new year is to keep the magic of naming a star alive, by continually developing new ways to visualize your star. And when we have new information about your star, we’ll add this to your gift for free! Everyone has their own traditions around the turn of the year and into the new year. One of these is reading a yearly horoscope. This horoscope makes a prediction based on the constellation which you were born in. Is a journey through the stars a tradition for you? 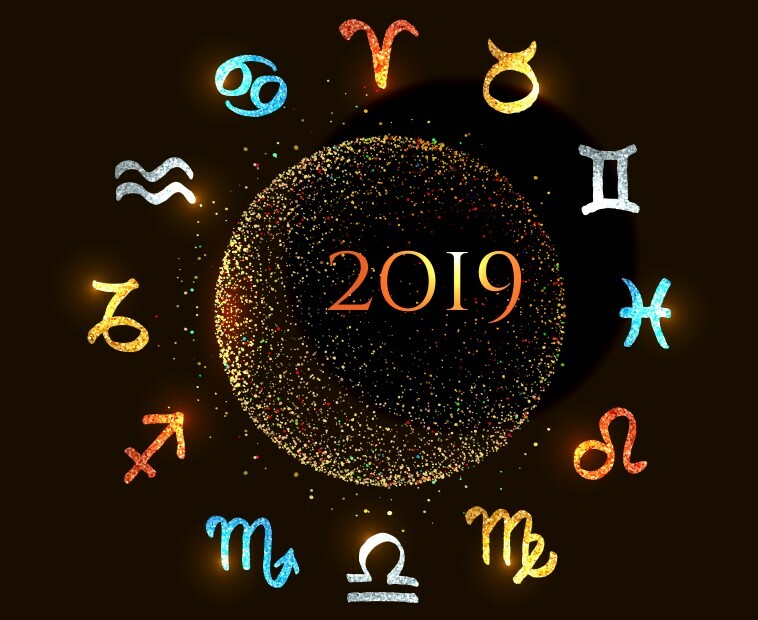 Then check out your horoscope for 2019 and discover what the stars have in store for you. We will take you on a journey to the stars and tell you what you can expect per astronomical season. Read more on what you can expect for 2019 and shine brightly into the new year! The Capricorn is influenced by Saturn and is therefore realistic, ambitious and practical. For 2019 this year means a glorious career. This winter you notice that you are more vital than previous years. For the spring of 2019, the position of Venus beams positive energy into your relationships. In the area of love and relationships you experience a boundless spirit that stretches far into the universe. During the summer you will find more peace. You are a shining star at work, so there is drive left for other things. In autumn you have to be careful not to work too much and enjoy your rest. Radiate calmness towards your colleagues, it makes difficulties at work become a lot easier to handle for you. 2019 is a serious year with extra brilliance for the Aquarius. This constellation is connected to Saturn and Uranus. That makes the Aquarius motivating, flexible and understanding. This winter you excel in making contact with new people. These relationships will guide your way. In 2019 you gleam towards the people around you. In spring, you occupy yourself with deeper issues in life. This creates an extra spark in your life as a result. Summer can be a difficult time. It is about finding the right balance between your independence and social life. In autumn, the power of the planets enables you to make dreams come true. This year you are able to outdo yourself regarding work, as long as you take others into account. Pisces are connected with Jupiter and Neptune. They are often indecisive, friendly and sensitive. In 2019, mindfulness and inner gloss are important for Pisces. This winter you weigh the advice of others, but don’t forget to trust the sparkle in your heart. The people around you will support you! During spring your path is filled with exciting challenges. Listen to others but keep yourself in mind before you make a decision. Not everyone agrees with your decisions. Keep working on yourself this summer and take the time to enjoy the little things in life. Focus on your body in autumn. Make sure to get enough sleep, adopt a healthy diet and your body will shimmer like never before. The constellation of Aries is influenced by the fiery planet Mars. The Aries is bursting with self-confidence, is steadfast and a fighter. 2019 is a proactive year with many highs. This winter is all about family, as they make up your universe. Talk about your feelings and worries, your loved ones will help you through it. This spring can be stressful at work. Be aware of your stubborn nature, this can sometimes cause problems on the work floor. The summer of 2019 may lose some luster. All goes well and you can even save a lot of money if you pay close attention to it. Autumn raises your energy level to great heights. Don’t go too fast and forget the people around you, as it can save you some stress. The constellation Taurus is connected to the planet Venus. The Taurus is materialistic, sensitive and persistent. In 2019 you use your willpower to excel in everything you do. This winter you seem content in regards to relationships. The single Taurus happy with this, but it can pose a challenge for couples. In spring you wish to watch your health. Don’t wear yourself out! This summer, your perseverance will make you blaze at work. If you remain motivated, you can take on new opportunities. During autumn there is a chance of experiencing a rut. Enjoy life and discover new experiences, as it will make you twinkle like a bright star. In 2019 there is a sign of change for the Gemini; shoot for the stars and good will come! The planet Mercury influences the Gemini. They are adaptable, humorous and communicative. This winter it can be lonely in love. Keep your emotions under control and enjoy being around people, you are a shining example for others. In the spring of 2019 you will have to pay attention to your health. Try to rest and do the things you like; this can make you blaze. Don’t be afraid of changes this summer. You will not regret it! This autumn you discover luster in your work. Take the opportunity to do things differently, and find your special glow. The constellation Cancer is connected to the moon. People with this star sign are sensitive, dreamy and sentimental. In 2019 the emotions of the Cancer can be very strong. Keep working on your energy this winter. Hold on to your magic by maintaining balance. You stay sparkling when knowing your limits. This spring you may have some trouble in love. Cancers are known to take their time to get to know new people. To find a partner you will have to step out of your comfort zone. Invest in yourself this summer and discover your inner sparkle. Your mind will radiate because of it! The stars predict a financial setback in the autumn. When you continue to develop in work you can intercept this like a star. The constellation Leo is connected to the sun. Leo are generous and all about their freedom and independence. The year 2019 is going to be about sparkling enthusiasm for you. This winter the stars predict the Leo takes his or her responsibility in long-term relationships. Eyes will light up whenever you are around. In the spring, wonderful things happen at work. Use your persuasiveness to reach your goals. During summer, your relationships center around romance and passion. Put some effort into your love life and it will make you twinkle like a star. In the autumn you may feel pressure at work. Keep your emotions under control, it will save you some frustration later on! The Virgo is influenced by Mercury. This makes you rational, professional and precise. For you 2019 is a year for loyalty and looking at the stars together. This winter you gleam towards friends and family. Talk to them about your feelings, this makes you shine even brighter. Spring can be spectacular for your relationships! Hold on to what you know, but also take initiative. This will allow long-term relationships to reach towards the sky. In summer on the other hand you can feel vulnerable. As a Virgo, your feelings run very deep. So be careful with who you show your feelings to. During autumn you will be a superstar at the office. Just don’t let your love life interfere with your work. The Libra is influenced by planet Venus. The Libra is artistic, intelligent and sensitive. The year 2019 is a year with many wonderful events. This winter a wonderful career opportunity will present itself to you. Grab this chance to work hard on a brilliant career. In spring, more chances will arise for both your career and private life. Do not miss out on these events, as it will make you ascend to high altitudes. A turning point can occur during the summer. Not everyone has the best intentions for you, and you will have to solve your problems yourself. Autumn will be calmer again and you are able to look back on the past year with stars in your eyes. The constellation Scorpio is connected to earth and the planet Mars. The Scorpio has a strong will, is empathetic and attentive. 2019 is an energetic year filled with wonderful opportunities. This winter starts quietly. You are feeling like floating through the sky, therefore doing a bit less rational thinking. Make sure you don’t stay with your head in the clouds, but keep both feet on the ground. During spring you are able to use positive energy to make you love life blossom, possibly with more than one person. You will certainly not be bored. Your summer is mainly about work, where you get the chance to sparkle. Just don’t let your success rise to your head. Autumn is mostly stable. Make time for your family and friends, as they will be your North Star. The Sagittarius is controlled by the planet Jupiter. They are calm, ambitious and confident. 2019 is a successful year in which you can shine like never before. This winter you can look back on a sparkling year in which you have achieved a number of goals. During spring you radiate positivity onto others. This period is full of magic and romance. In the summer you will excel, no obstacle stands in your way. During the autumn you gleam in both short and long relationships. New relationships have the chance to last a lifetime. During the holidays you can look back with your family at another enchanting year. Dazzle your way into the new year with your year horoscope for 2019. Take your chance to shine like a superstar next year! Let the stars be your guide to a dazzling glow in your life. Also find your star sign in the sky with our free OSR Star Finder App. Download this app on your phone, and navigate to your zodiac sign to find more information. Shoot for the stars and make 2019 your year! Do you love what the stars have to say about you? Name a star in your zodiac sign! Name your own New Year’s Star! Super-Earth’s Climate Has Been Mapped! Name a star now! - What is written in the stars for you in 2019?